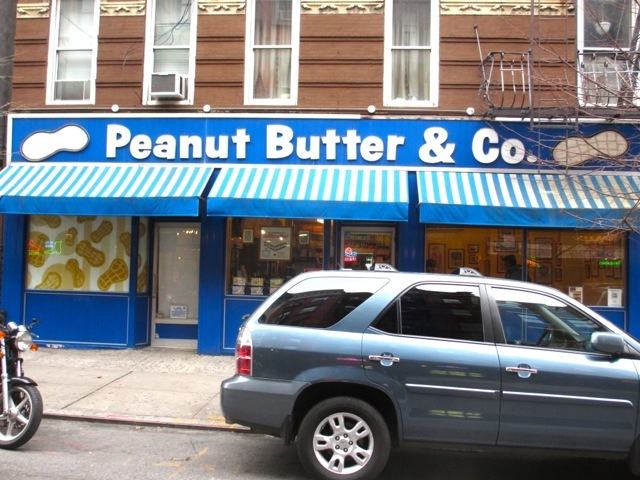 Everyone has their favorite flavor of Peanut Butter & Co.’s fun jarred peanut butter (mine is dark chocolate), but when was the last time you went to their little West Village eatery? The store does not use organic bread or locally sourced peanuts, like others in the neighborhood, but that’s not the point here. This is kid food at it’s finest. After all, what’s more of a beloved children favorite and a secret grown up treat than peanut butter? The menu here reads like Willy Wonka kidnapped by Skippy: sandwiches such as cookie dough surprise, peanut butter BLT, and fluffernutter, and desserts like PB&J pretzel sundae, and peanut butter brownie blast sundae. 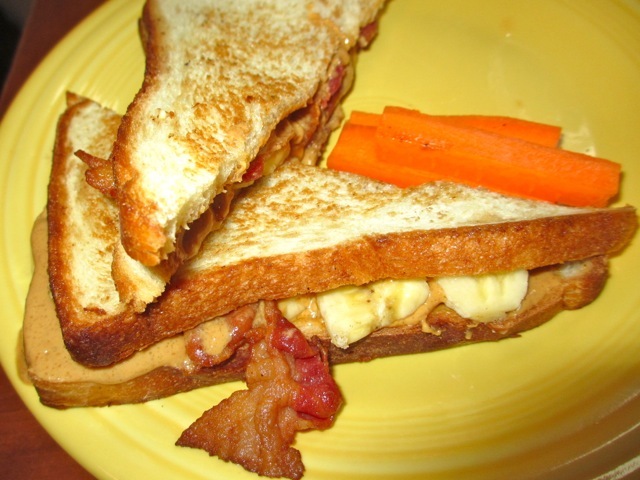 We love the signature Elvis ($7.50), grilled maple pb sandwich, stuffed with banana, honey, and bacon. It is a great salty, sweet treat. We also had the Pregnant Lady ($6.25) with pb and bread & butter pickles. It’s an unusual combo, which wasn’t my favorite, but my pregnant lady sure dug it! PB & Co. is really fun, and definitely underrated. I am not sure why they have not spread all over NYC or even the country, but bring your kids, or just yourself here, and enjoy. grilled seasonal catch (we had tuna) with cabbage, crema, tomatilla & avocado salsa. The tuna was tasty and the condiments added a lot of flavor, as they should for a basic grilled fish taco. The shrimp taco ($3.25) was tastier, of course, because it was beer battered chipotle shrimp, along with jicama, crema and pineapple salsa. But both were great for a quick snack or add a quality Doado Chopped Salad ($6.95) of romaine, green cabbage, jicama, tomatoes, cucumbers, scallions and watermelon with citrus & chipotle dressing & queso fresco for a complete, healthy meal. Not to paraphrase from Taco Bell, but thinking outside the bun is a great option, especially in the warmer weather. I usually write-off falafel as mediocre street food that is neither very satisfying nor healthy. However, a recent visit to Taim has changed my perception with the best version I have tasted. 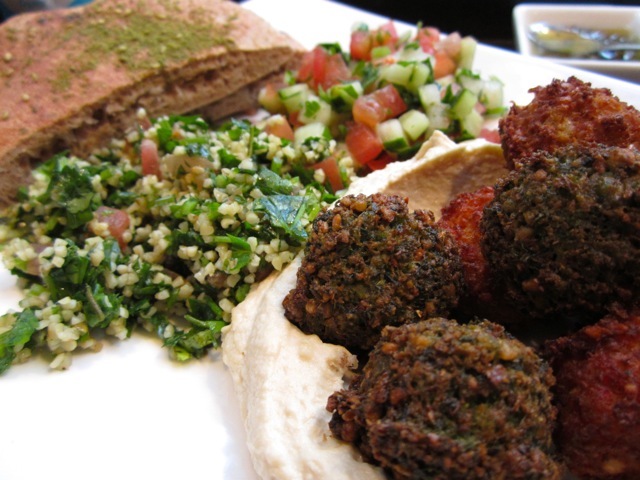 Spud and I tried the mixed falafel platter ($11.50) with hummus, tabouli, and Israeli salad. The salads were all high quality, but the 3 falafel flavors, green (traditional), red (roasted pepper), and harissa (Tunisian spices), were the stars. They were all flavorful, light, crispy, and not greasy. We also tried the Sabich sandwich ($7.25) of fried eggplant, hard boiled egg, hummus, Israeli salad, tahini and amba sauce. 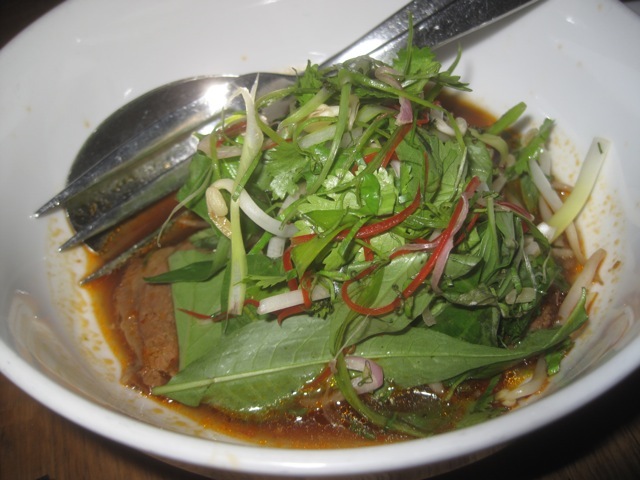 It was messy, but very tasty, with bursts of complementing flavors. 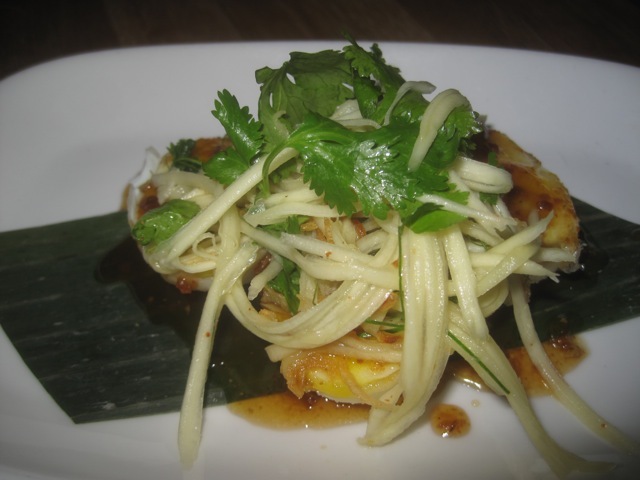 Taim is tiny with only a few stools, and with a 26 Zagat food rating, it gets busy. So order take out or find their mobile truck and revisit this Middle Eastern staple. I have eaten dinner at 4pm with the blue-haired crowd in Florida and I can’t really recommend it. 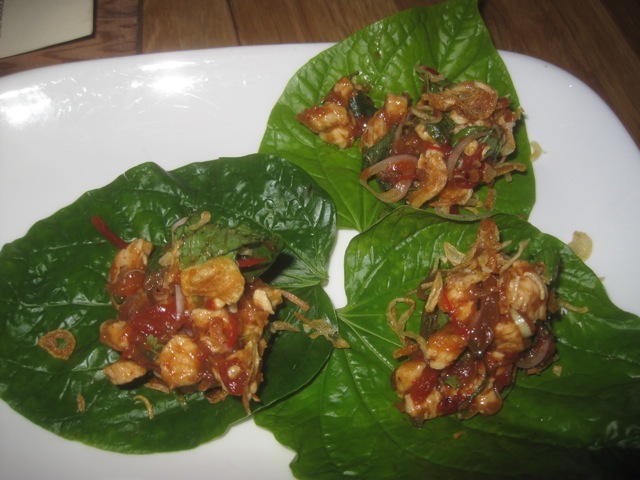 A much more exciting early bird special is at Betel, a Malaysian restaurant in the West Village that offers an 8 course menu between 5:30 and 7:30 for only $35! Yeah, it is a pretty ridiculous deal. Of course we had a couple of drinks at the bar, catching up with our friend Joanna, which added another $14 each to our bill, but the stormy mule and ginger mojito were well worth it. The food was very good as well. 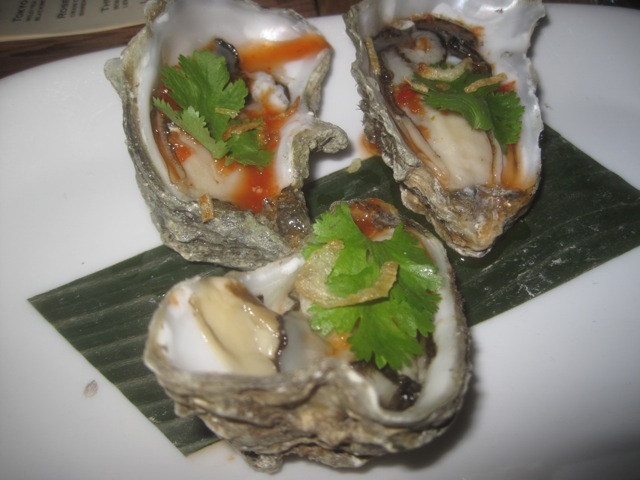 We toured flavors of Asia, starting with a West Coast oyster in cilantro and fried shallots and ending with tender wagyu beef, the unanimous choice for tastiest course. 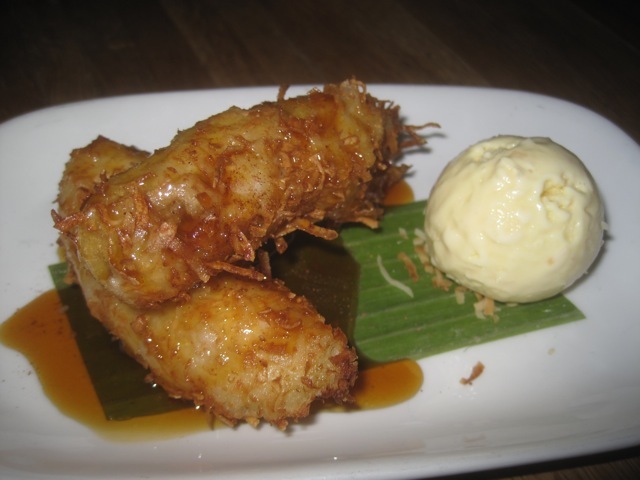 The dessert was fried banana, which had a thick batter. 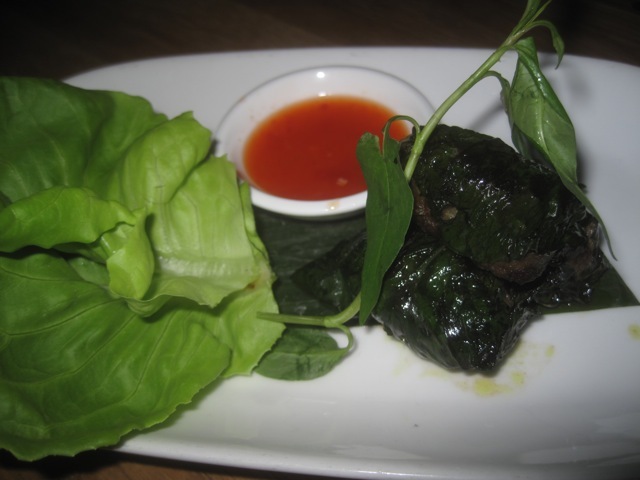 My only complaint about the menu was that almost all the courses had similar flavor profiles of mint and cilantro. I am no authority on Malaysian cuisine, but they might want to mix it up more, considering it is 8 courses, plus mint in the mojitos. But, overall, it is a fun experience that works well for a date in a trendy setting, with open windows out to Grove Street. While the 25 Zagat food rating might be slightly high, you won’t find a more exciting 8 course deal for that price anywhere else. Plus, there was not a blue hair in sight. Besides the summers off, there is another great perk about being a teacher couple, being able to arrive at dinner at 4:50 pm. What’s considered early bird in Florida, is also the secret to getting a table at one of the most consistently popular reservations in NYC. 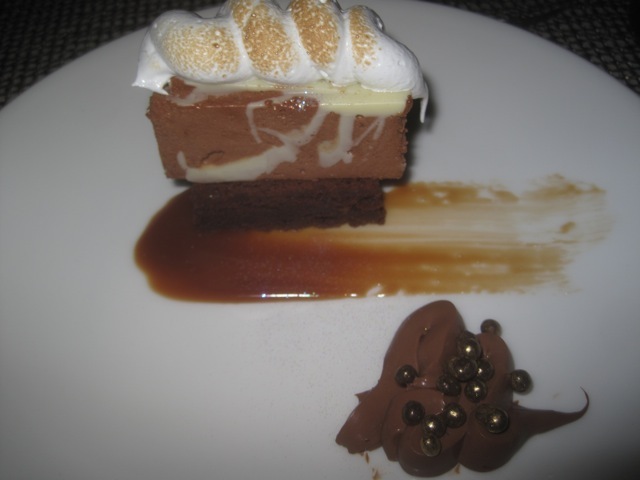 It has been 13 years since Mario Batali’s flagship Babbo has opened and it is still on top. While he has opened many other NYC eateries, Esca, Lupa, Otto, Casa Mono, Del Posto, and the enormous Eataly, most people still love the casual enoteca that is Babbo. If you show up here at 5:00, have a drink at the bar, you will most likely be eating by 5:30. It may be early, but with the incredible 8-course pasta and dessert tasting, it turns into a 2.5 hour feast. 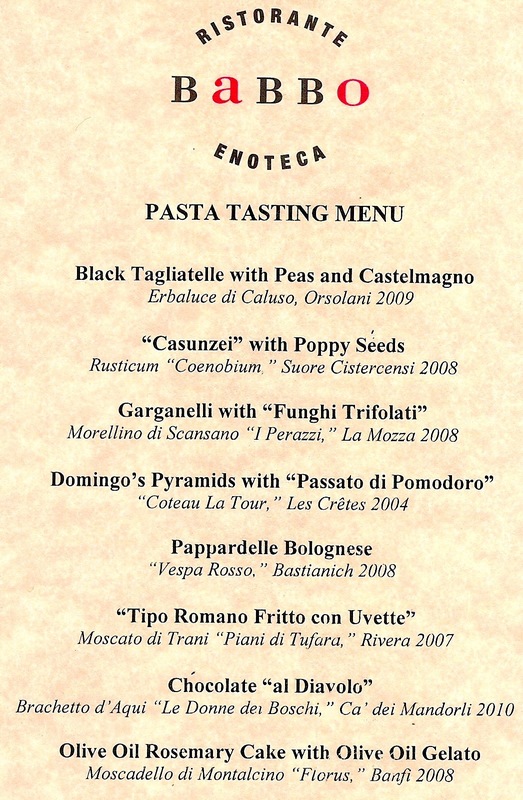 We had 5 truly exceptional pasta courses, progressing in heaviness. From the simple pea sauce in course 1, through the hearty ragu in course 5, is was an amazingly satisfying menu. The 3 desserts were just as interesting and delicious. While this might not pushed the envelope as much as other tasting menus, more importantly it actually gives you what you want and yields an exceptionally satisfying dinner. At $69 for 8 courses, it is an excellent deal and a ton of food. Plus, the setting is an intimate townhouse and service is top notch. Somehow, after hearing rave reviews of Babbo for 13 years, my first visit turned out to be an underhyped experience and the most enjoyable dinner I have had so far in 2011. If you are looking for a good time, have a hell-be-damned attitude towards calories, and like down-home Southern food – you might be Paula Deen and you will probably love Lowcountry. There is nothing subtle here, except maybe the exterior, which seems like only a bar, but it does work as a guilty pleasure. Lowcountry cuisine is that of South Carolina’s coast. It’s big into fried food, shrimp and grits, biscuits, etc. At Lowcountry in Manhattan, you walk from a relatively quiet, elegant West Village street into a packed bar playing very loud rock tunes, and beyond to a small seating area. It’s definitely a place to indulge and there is a lot to indulge on. We started with the pimento deviled eggs and the iceberg wedge salad with bacon and deviled egg dressing. Both the deviled eggs and iceberg wedge are classics from the 1960’s that have been lowcountrified with the additions of the pimento cheese and the bacon and egg dressing. 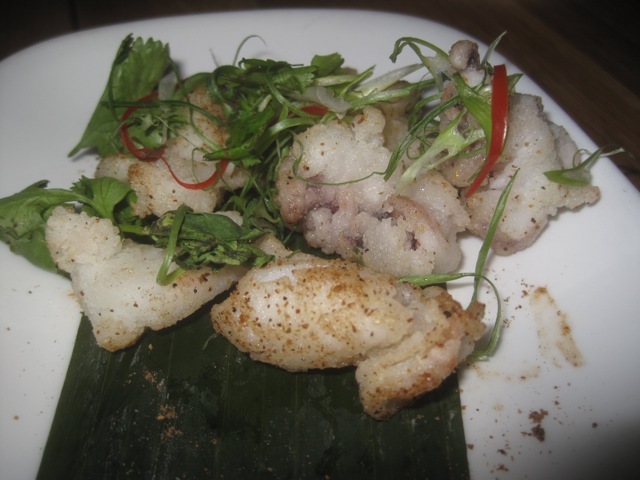 They both had bold flavors and were great starters. For mains we had the Fried Chicken Breast, Cheddar Biscuit Country Sausage Gravy, Onion Jam and Cornmeal Dusted Catfish Carolina Red Rice and Beans, Chow Chow Remoulade. Both were very saucy and indulgent with many flavors packing a punch. I preferred the catfish, but maybe because I had it first and was full when I got to the chicken. I did like the onion jam on the chicken, but the addition of the biscuit and gravy was a little much for me. But I think if I was here with a group of friends, and wanted to have lots of drinks and let loose, Lowcountry would be the perfect place to do it. It is very similar to the Mason Jar in Murray Hill, in that it’s a bar and comfort food destination and doesn’t care about local organic ingredients. It just wants you to have a good ol’ time! Everything about Flex Mussels seems to reflect Top Chef: Just Desserts contestant Zac Young. Even though he is the Executive Pastry Chef, and not the owner or executive chef, customers are clearly coming in for Zac and his desserts. He is clearly the face of the restaurant (see below). The ultra corny name and the stark white, modern interior seem to embody Zac’s flamboyant personality. 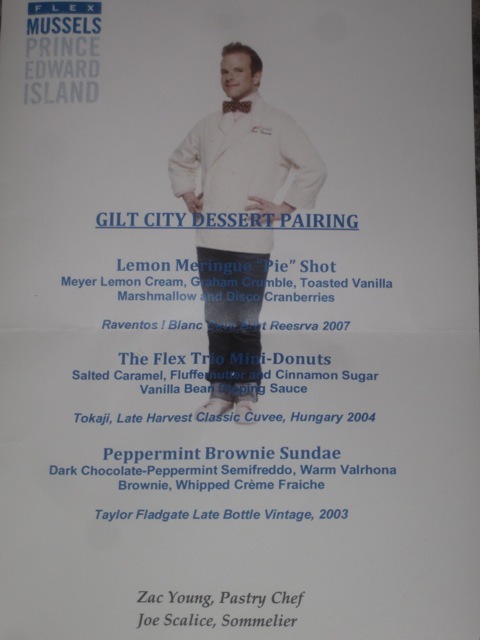 Our awesome friends, Kim and Jared, invited us to Flex for a special Gilt City 3 course dessert pairing. We had the honor of meeting Zac and talking with him for a few minutes. He was exactly his TV persona, happy, gregarious, and very pleased with all the attention. But while it was a surprise to talk with him, we were really here for his food and wine pairings. 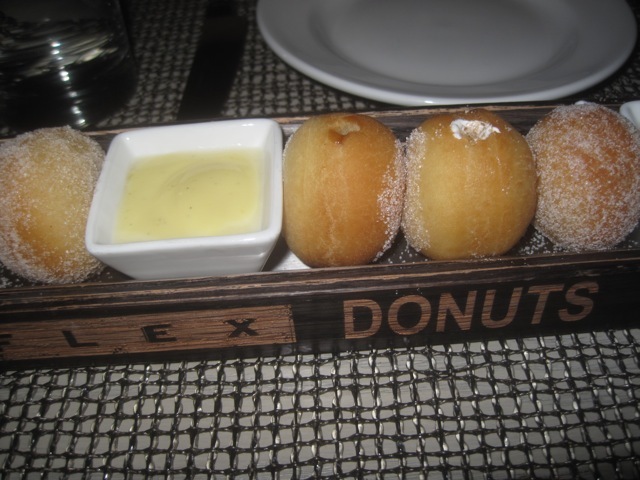 Of the 3 courses, the Lemon Meringue “Pie” Shot and the Peppermint Brownie Sundae were excellent, but the real star was the Flex Trio Mini-Donuts. This warm trio consisted of salted caramel, fluffernutter and cinnamon sugar with a vanilla bean dipping sauce. I can’t stop thinking about the fluffernutter with its salty peanut butter, and sugary fluff encased in sweet dough. Pure genius! The brownie sundae is always going to be a crowd pleaser with dark chocolate peppermint semifreddo and warm valrhona brownie and whipped creme fraiche. It was a perfect conclusion. It was really a special event with a great flight of desserts paired with exceptional wines, which I won’t even comment on, because my wine knowledge is nonexistent. 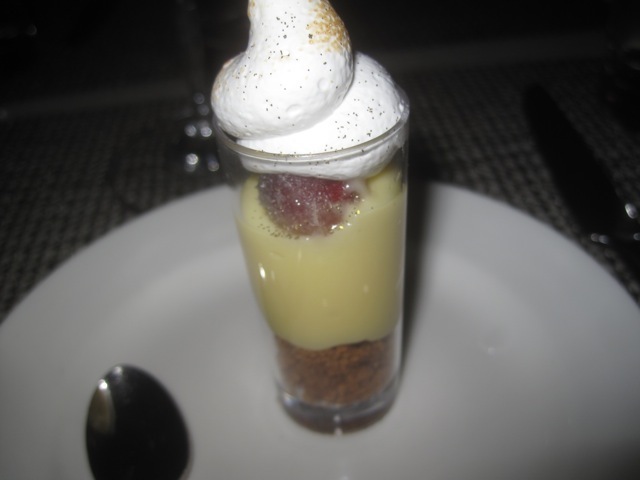 Each dessert individually would not have been completely satisfying, but as a progression, it worked really well. Zac Young may not have won Top Chef, but with his strong personality and even stronger sweet offerings, he may win over NYC one diner at a time. Next time I will have to check out the mussels – I’m sure they are pretty good too. Artchoke’s pizza is a guilty pleasure and definite craving for both Spud and me. I crave pizza all the time, but Spud less so, although quality isn’t as important to her. She even craves Elio’s frozen. 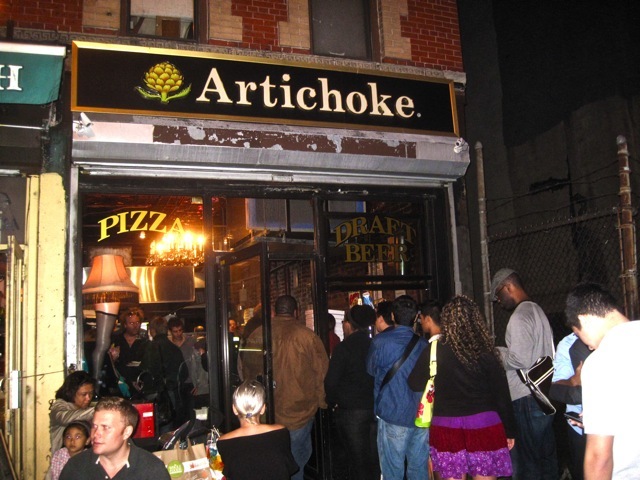 But Artichoke’s signature pizza is like nothing we have ever tried before. 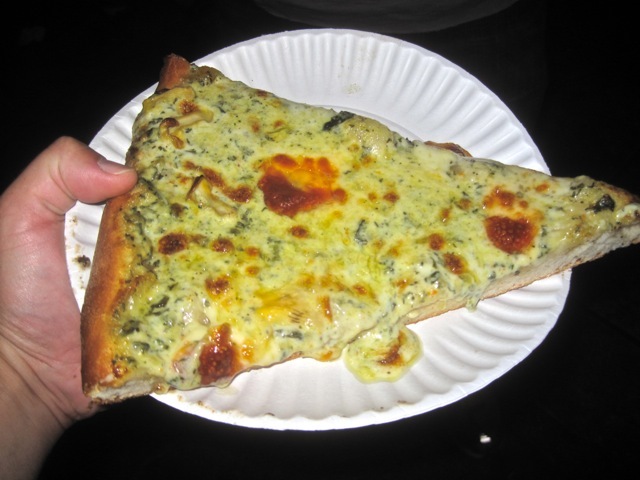 It is white pizza topped with a creamy artichoke dip, like you would find on a list of Applebee’s apps. 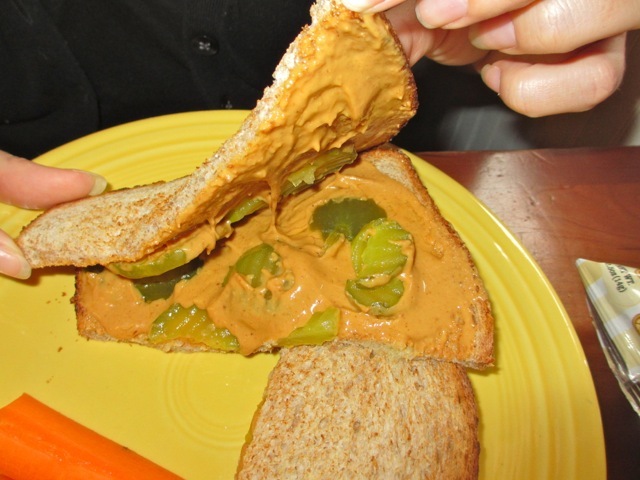 It may sound gross, but it’s a really amazing, ingenious idea. The flavor and texture of the mixture complement the sturdy crust perfectly. The slices are huge and filling, and one is usually enough. They also have a margarita slice and a crab slice, which I’ve heard are also quite tasty, but I doubt that I will ever order anything besides the amazing namesake. The take-out only East 14th location is open late, which works well after going to one or more of the many bars in the hood. They have a new full-service eatery on 10th avenue under the Highline, which I want to check out, and also a new take-out place near Washington Square Park. This isn’t an old school NYC pizzeria, it’s young co-owners are have something special here and know what their customers desire. Pinche Taqueria is the complete opposite of Cabrito. It is small hole-in-the-wall that is easily missed on a triangular shaped block outside the Bleecker Street 6 train stop. The space is small, but cool with entrances on either side of the narrow space. Even though the decor is tacky with plastic Mexican kitch on the walls, it somehow has an authentic air about it. The staff is friendly and the food is first priority. While it is hard to give Pinche a full review considering I only had a pair of fish tacos and sat outside on a bar stool, and was too hungry to take photos, I can still tell that this place is a winner. The fish taco was delicious. 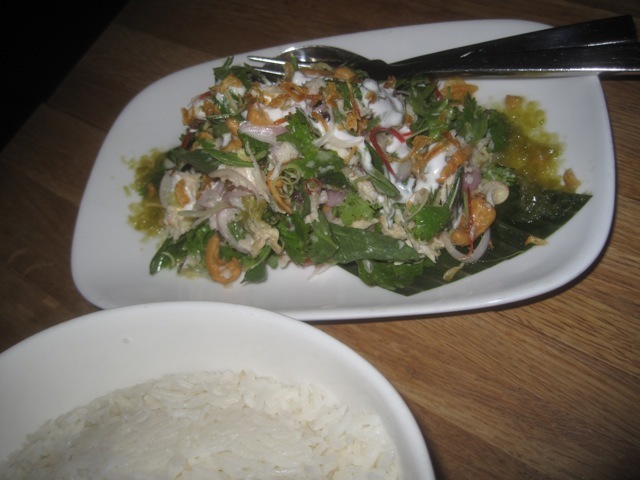 The fish, probably tilapia, was moist and flavorful with the standard toppings of lettuce, radish, cheese, etc. 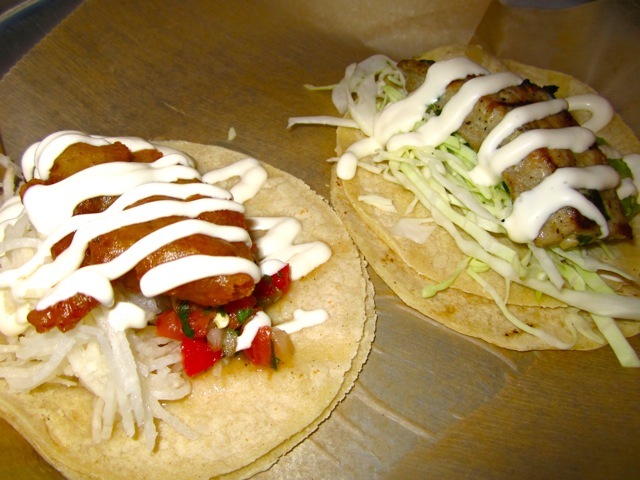 and was delivered in a double corn tortilla – as it absolutely should be. Plus, it was only $3.95 a piece, in contrast to Cabrito’s $6. I also recently read that Time Out recommends its Huevos Rancheros for brunch. While Pinche will never get the hype of a Cabrito, if you want inexpensive, authentic Mexican street fare, this is a winner. Although if I had to pick, I still prefer the fish tacos at Taqueria Downtown in Jersey City. Such a dainty name for such hearty food…. We are the anti-Valentine’s Day couple…..I mean, not completely. We acknowledge its existence and WeCouldEat and I are always willing to take the opportunity to say how much we love and appreciate one another (yes, we are annoyingly happy and even more frustratingly not afraid to admit it!) But, we do refuse to pay double the amount for food in Manhattan just because of the Hallmark Holiday (we feel similarly about New Year’s Eve). So, we use it as just another excuse to find a fun hole-in-the-wall establishment to raid in the city. This year we went to The Pink Tea Cup, a small Southern soul food joint. Do not be fooled by the unassuming name……The Pink Tea Cup is small in size, as is the menu, but the food packs a heavy calorie laden, deep fried wallop. Fans of soul food will be exceedingly happy here. If you are watching your diet, just keep walking and don’t stop in. If you’re like us and you believe that you need to eat large amounts of every type of food every once in a while, then journey in and take a seat. The service is friendly and you can take a look at all of the famous people who have dined here over the years as you debate between fried chicken, smothered pork chops and chicken fried steak. I went for the smothered pork chops and my hubster had the fried chicken and we both had the collard greens and black eyed peas to go along with it. It came with heavily buttered corn bread and a very salty chicken soup and just when you could not handle any more food, they serve you a large hunk of super-sweet bread pudding. Now, we don’t get stuffed easily, and if you know my husband’s love affair with pudding, than you would not believe that we couldn’t eat more than a bite or two of that dessert. The smothered pork chop was heavenly……covered in a hearty batter and deep fried and smothered in a rich dark gravy. The sides were flavorful and meaty (as all good southern greens should be!). I just loved watching all of the other diners ingest large plates of fried foods and mac-n-cheese. The music was perfect, as well. Check this place out when you’re in the mood for a completely soulful night……what better way to say “I love you”! ?